FMC™ 205 Product Information | Smooth-On, Inc. Specific Volume 20.1 cu. in./lb. FMC™-205 is a polysulfide rubber mold compound that cures overnight with negligible shrinkage to a lasting durable rubber that will perform in production. The mix ratio is 100 parts of Part A to 12 parts of Part B by weight. FMC™-205 cures to a Shore hardness of 12 A.
FMC™-205 is ideal for those applications that require capturing intricate detail from a variety of model surfaces. 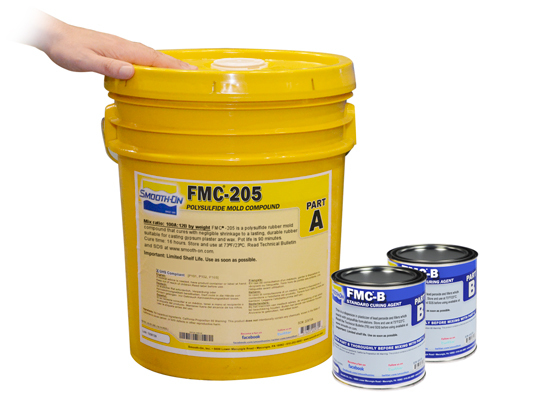 Unlike polyurethanes, FMC™-205 is not sensitive to moisture and can be poured directly over wet plaster or water/sulfur based clays. Common applications include molds of sculpture (lost wax process), casting various gypsum products and waxes. Some Materials Must Be Sealed - To prevent adhesion between the rubber and model surface, models made of porous materials (gypsum plasters, concrete, wood, stone, etc.) must be sealed prior to applying a release agent. SuperSeal™ (available from Smooth-On) will seal porous surfaces like gypsum or wood and have minimal effect on surface detail and texture. Sulfur-free and non-water based clays require release agent only. Thermoplastics (polystyrene) must also be sealed with shellac or PVA. In all cases, the sealing agent should be applied and allowed to completely dry prior to applying a release agent. MEASURING AND MIXING - YOU MUST STIR PARTS A AND B THOROUGHLY BEFORE YOU BEGIN. Materials should be stored and used in a warm environment (72° F / 22° C). This product has a limited shelf life and should be used as soon as possible. Mixing should be done in a well ventilated area. Wear safety glasses, long sleeves and rubber gloves to minimize contamination risk. After mixing Part B, pour the desired amount (as measured by weight) into a clean container. Add the appropriate amount of Part A by weight.